The president might be the most important candidate in Texas in November — and he's not even on this year's ballot. This president casts a big shadow. Donald Trump’s popularity with Texas Republicans could buffer any midterm election blues; if you’re with him and he’s popular, you’re in good shape. If he’s not popular when it comes time to vote, of course, a lot of Republican candidates could go down on Election Day. That said, Texas Republican voters overwhelmingly approve of the job he’s doing now — Democrats, by similar margins, overwhelmingly disapprove — and Republican candidates up and down the state ballot take sides against Trump at their peril. But the president’s shadow is bigger than that. Everybody else in Texas politics is having a hard time getting and keeping the public’s attention. What is ordinarily a three-ring circus is often more like a one-man show. It’s not just a matter of what’s in your Twitter feed. The president is the political equivalent of must-see TV. The little folk down here in the provinces — the governors, legislators, mayors and whatnot — are small beer. It’s always true on some level: the 2010 mid-terms, dominated by the then-new Tea Party, were partly a backlash against Barack Obama’s politics. But Trump is something else entirely, dominating the news, the civic conversation, the public imagination. Everybody and everything else are side dishes, Tom Sawyers to our Becky Thatchers, showing off to try to get our attention. Gov. Greg Abbott got unintended attention this week by tweeting a quote he attributed to Winston Churchill. Sir Winston never said it. Abbott got embarrassed. The grackles on social media had a big day. But look: This started with a governor using social media to get your attention — a “hey, look at me” moment. Anybody else see Trump’s shadow in that? How about this one: State Sen. Don Huffines, R-Dallas, facing a tough re-election race this year, took off for Moscow this week with U.S. Sen. Rand Paul and a small group of other pols to tell the Russians to stop messing with American elections. Got your attention? At this point on the calendar two years ago, Texas Republicans had locked in a number of the issues they would pursue in the 2017 legislative session. They were, as they are now, getting ready for a general election. And many of them were nervous that the presidential race between Trump and Hillary Clinton could change things for the small fry on the ballot. They were worried, in the traditional way, about the coattail effect of the candidates at the top. This year, there’s no presidential race. But they’re thinking about the same coattail effect. 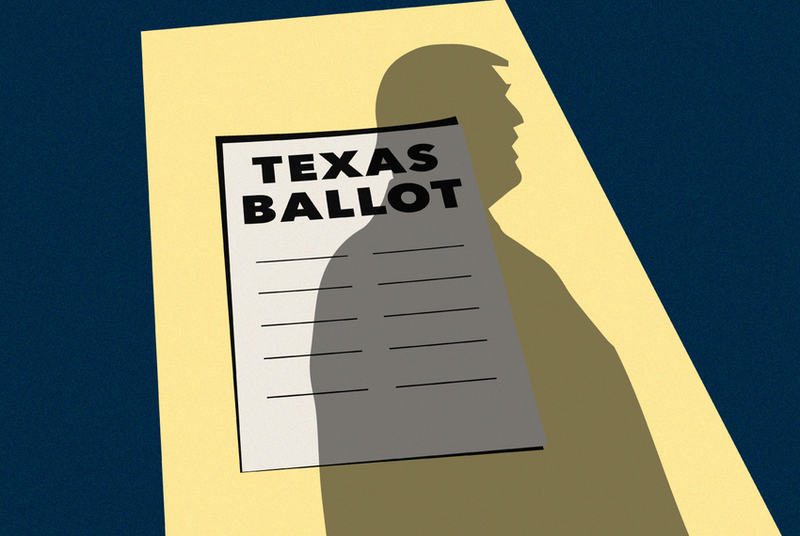 Trump’s shadow is important in an election in Texas that has so far been — with the notable exception of the race for U.S. Senate — relatively low-key. In fact, it’s a two-coattail ticket, with a race for U.S. Senate that looks competitive and interesting and a race for governor that, so far, doesn’t. Candidates running for Congress — behind the Senate race, ahead of the race for governor — will be somewhat dependent on what’s happening above them. In fact, the Houston Chronicle quoted U.S. Sen. Ted Cruz this week saying he hopes and expects the president to help him and other Texas Republicans with pre-election visits. Meanwhile, the contest for governor could — if summer polls hold — be a different story, with candidates below more dependent on that outcome than on anything that happens in the top race for Senate. Except for Trump. His shadow might just overwhelm everything else. If Republican voters are out and about in this general election, enthusiastic and defensive of their man in the White House, Democrats’ hopes that the midterms go their way could be wrecked. If he’s doing poorly — that is, if it’s the Democrats who are stirred and motivated and Republicans who suffer the doldrums — the president’s situation could overshadow worries about Lupe Valdez’s strength against Greg Abbott and the effect that could have on candidates down the ballot. Straight-ticket voting accounted for 64 percent of all voting in the state’s ten largest counties in the 2016 general election. If that holds in 2018, almost two-thirds of the vote will be cast with more attention to party than person. No offense to Ted Cruz or Greg Abbott, or to Beto O'Rourke or Lupe Valdez, but the straight-party vote in Texas this year is likely going to be an up-or-down referendum on the most dominant and attention-gobbling figure in American politics right now. Trump’s shadow is the biggest coattail of them all.